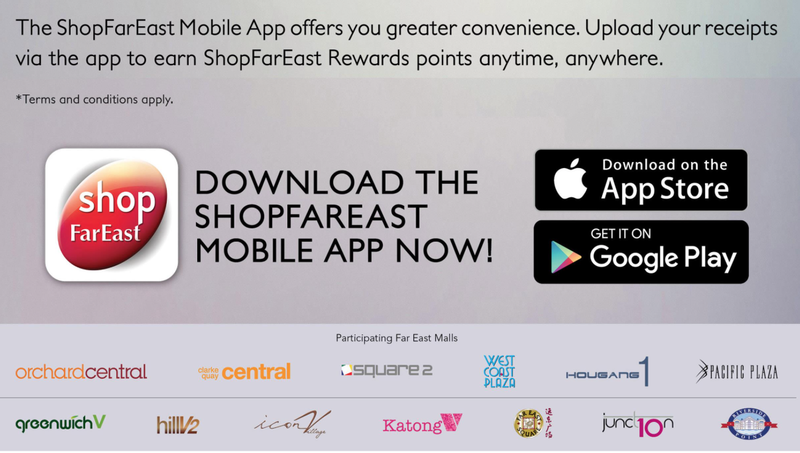 ShopFarEast Rewards Programme - Earn Points When You Shop & Redeem Rewards Through The App! I'm sure that many of you would have had the experience of accumulating a ton of receipts and not knowing what to do with them. And, at the end of the day, you just end up dumping all of them. And for someone who has been through this a lot, I always end up not taking the receipts from the cashier so that I don't have to go the extra mile of throwing them away. However, the next time you do this when shopping at any of the 13 Far East Malls, you might want to rethink your choices and save up your receipts to accumulate points and redeem rewards through the ShopFarEast Mobile App! You can download the app through the IOS or Android app stores simply by searching 'Shop Far East'. Once you have downloaded the app, just sign up for an account, and you'll be good to go! ShopFarEast Rewards Programme is a loyalty programme that enables shoppers to shop/dine at any of the 13 Far East Malls, earn/clock points and redeem for rewards! For those of you who might not be familiar where the 13 Far East Malls are, here they are! 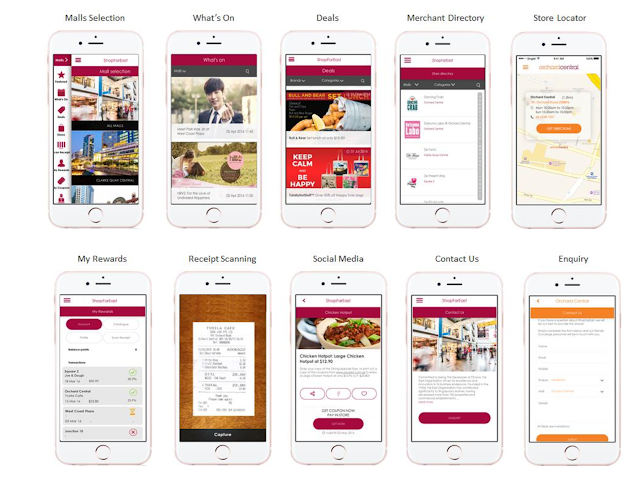 For starters, here are some of the main features of the ShopFarEast Mobile App! Once you're in the app, you'll be greeted with a myriad of shopping discounts that are exclusively available on the app! You'll also be able to find out the latest events, promotions and offerings at all 13 malls! As you click on the tab at the top left corner of the app, you'll find a list of options for you to choose from. To clock your points, simply click on the 'Scan Receipt' tab! Once you are in there, simply follow the instructions on the app and you'll be good to go! Points can be accumulated with a minimum spend of $20 nett on a single receipt. Every dollar spent at participating malls and stores earns 1 point (for supermarket purchases, every 3 dollar spent earns 1 point), up to a maximum of 500 points a day. 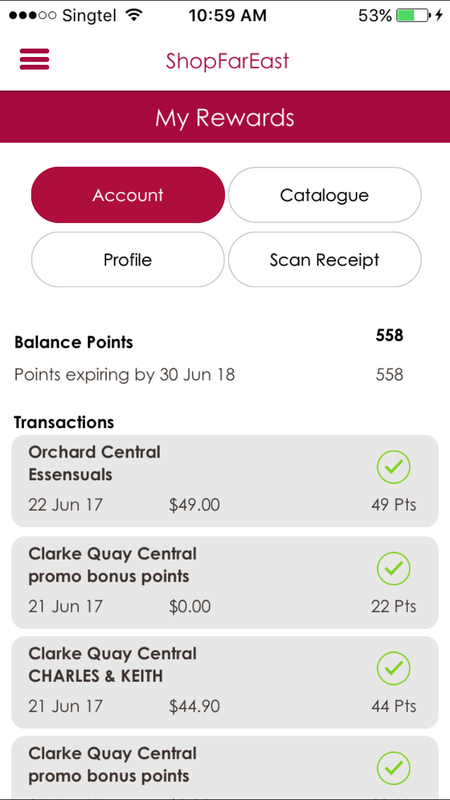 Once you are done uploading your receipts, you can click on the 'My Rewards' tab to check your points balance! Some of the participating merchants or outlets are Cold Stone Creamery, Dean & DeLuca, Tung Lok Group, as well as Oasia Hotel Downtown, Oasia Hotel Novena and Rendezvous Hotel Singapore! So, you can look forward to redeeming meal vouchers from participating merchants, parking discount or even a highly discounted staycation with these points! OH, and you can even redeem an Apple Watch with 30,000 points! And, of course, you'll also be able to redeem Far East Organization Mall vouchers. And since these vouchers can be kept through a period of time, you can first redeem these vouchers and then think of what and where you want to spend them on! 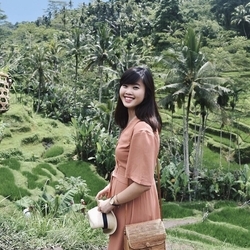 Here's an example of how you can redeem the ShopFarEast points you have accumulated! Check out how I've spend the rewards I've redeemed! Hahah honestly, I was so excited when I redeemed my first Far East Mall Organization Mall voucher through the app that I treated myself to a subway meal. Dined at Steamroom With The Pillars & Stones (again!) at Orchard Central through the Far East Organization mall vouchers I've redeemed! Enjoyed a sumptuous meal at Genki Sushi with Claudia! Treated the bf to a meal at Tanuki Raw at Orchard Central! We've been wanted to try this restaurant for ages! Got myself a new pair of kicks from Charles & Keith at Clark Quay Central! Treated my family to a Father's Day dinner at Joyden Canton Kitchen at HillV2! And I can't wait to use the remaining vouchers I've redeemed at Two Men Bagel at Icon Village tomorrow! Have been hearing lots of good reviews about the bagel store and we finally have more reasons to try it out!